1. Measure the piece of art that you wish to mat. For quick reference to common standard mat board and frame sizes please see the sizing guide found at the bottom of this page. 2. Find your mat board's inner dimensions. The inner dimensions or window of the mat board should be 1/2 to 1/4 inches less than the dimensions of your piece of art. This provides a surface to which the work can be taped or glued. For instance, a 5 x 7 photo ought to have a window that measures about 4 1/2 x 6 1/2 inches. 3. Choose your mat board's outer dimensions. Along with custom-cut mat board, REDIMAT offers a variety of outside dimensions for most of its precut mat board sizes. Some works may benefit from a wide border, while others may simply get lost. Price is twice that of the single mat board pricing found on any mat board material page. 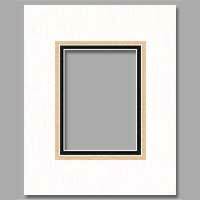 Triple matting uses three mats to accent your art or photography. Price is three times that of the single mat board pricing. With bottom weighting, the border is wider on the bottom than the top, which can look quite nice. Price is the single mat board pricing. 4. Choose the quality of mat board. Different pieces of art require different grades of mat board. An inexpensive snapshot will benefit from standard economy mat board (paper) while an important family heirloom deserves nothing less than museum-grade mat board 100% Cotton RagMat board. 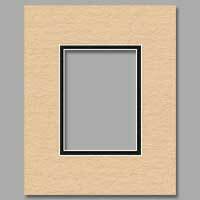 Affordable paper mat boards come in an exciting range of decorative colors and styles. 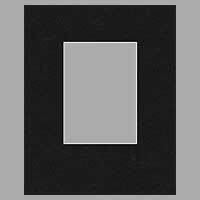 An elegant, refined 100% virgin alpha-cellulose mat board offering archival protection at a much discounted price. Superior 100% cotton mat board offering quality and unsurpassed protection. 5. Choose a backing board. Backing boards or mounting boards go behind the piece of art to offer support to the mat board and the art. REDIMAT offers an extensive variety of sizes in foam core (archival acid-free or standard craft grade), museum grade rag and economy acid-free boards. 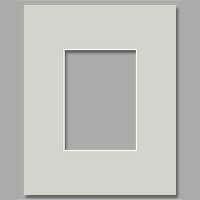 Also, available in solid black mounting boards, and black foam boards. 6. Make sure you have the right supplies. 7. How many photo mats do you want? 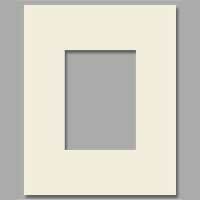 REDIMAT offers bulk discounts on orders with as few as six mat boards (same color, same size). Plan ahead and save. 8. Have your Visa/Mastercard/American Express and order information handy. Quick reference guide to selecting the right size mat board for your pictures and art. We offer our all of our mat board products in the most popular picture and frames sizes including several harder to find square picture sizes. The chart below is a guide to matching your artwork with the perfect matting. Frame size is the same as the outside dimensions of the mat board. The mat size lists the outer dimensions and the the exact window size to fit a given print size. Fits artwork is the size of the printed area of your photos or art. Be sure to check out our full line of bulk pre cut matting from our Economy, Convervation and Museum RagMat or discounted Show Kit offerings. You can also easily create custom mat sizes in any material.